During the 1973 Yom Kippur War, the Syrian Army attempted to overwhelm Israel's northern defenses with a massive armor assault. The IDF decimated the Syrian armor and after the war, these tanks were recovered by the Israelis. 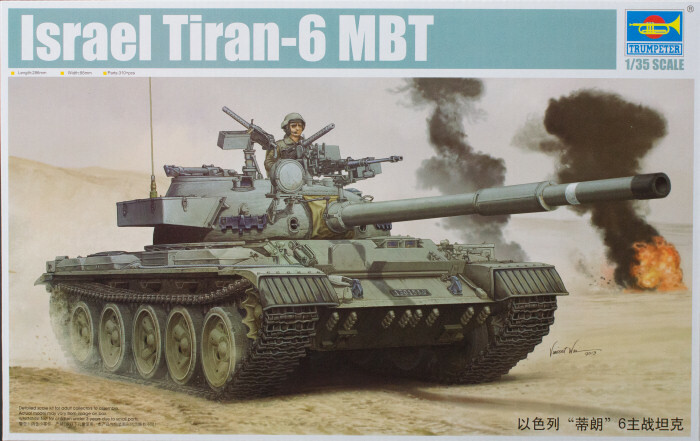 Those tanks that didn't suffer significant damage were repaired and pressed into service with rebuilt T-62s designated as Tiran 3. With a limited availability of spare parts and ammunition, 120 of the T-62 tanks were again rebuilt, replacing the engine, armament, and communications with US-made equivalents. These tanks, in turn, were designated as Tiran 6. Trumpeter has released several variants of the T-62 main battle tank and here is another that is very distinctive in its configuration and service. Molded in light gray styrene, this kit is presented on 17 parts trees plus four trees molded in black styrene, one tree of clear parts, one tree of gray vinyl parts, three frets of photo-etched parts, one turned aluminum barrel, and a set of pre-formed wire parts. This is the first kit I've seen where the finer grab handles and brackets are provided as pre-formed wire parts rather than the frustrating tiny styrene parts that either break or disappear when removed from the sprue trees. Some have used photo-etch for these parts but most modelers opt for wire anyway, Kudos to Trumpeter for providing these parts pre-formed and ready for installation! This is a nice looking kit and will build into a distinctive counterpoint to park next to one or more T-62 variants. If you want to have even more fun, you can use this kit as the starting point for the Tiran 6s that are in service in various countries in Latin America and elsewhere. Nicely done Trumpeter!